Ce est une belle maison sur deux 3bd beaucoup d'arbres cloutés 1400 sq. Ft. De bain. La maison dispose de planchers de bois franc dans le salon / salle à manger et chambres à coucher. Étages dans la cuisine, salles de bains et salle de boue récemment carrelée. Cette maison est située dans la petite ville pittoresque de Coffman Cove. Coffman Cove offre de pêche de flux pour le rouge, rose, argent, et le saumon kéta. Steelhead, Dolly Varden, et la truite arc sont également très abondantes dans les ruisseaux. Saumon royal peut être pris dans la crique de mai à Juillet. Crabbing de skiffs loués produisent une abondance de crabe dormeur. Palourdes à marée basse est aussi très gratifiant. Observation de l'ours, la spéléologie, l'observation des baleines, la randonnée, le kayak sont quelques-unes des nombreuses choses à l'expérience dans ce domaine. Pour arriver à Coffman Cove, vous pouvez prendre un hydravion de l'aéroport de Ketchikan ou de prendre le ferry pour Hollis et conduire sur une route pavée à Coffman Cove. Le ferry est un beau voyage de 3 heures où vous pouvez voir l'Orca occasionnelle ou baleine à bosse du bateau. Suburban à louer et un 16 pieds. Skiff à louer, nous pouvons organiser des visites de charte pour le flétan et le poisson de fond ou l'observation des baleines pour les frais supplémentaires. Our trip to Prince of Wales was to see caves on the island. Beaver Falls Karst Trail is a wonderful trail for the non-cavers and the Capitan Cave is also an excellent adventure. Red Dawg provided us with a great location to see the caves and to be close to supplies. My husband was also successful at fishing between cave trips because of all the information in Red Dawg Retreat. We spent a week at Red Dawg Retreat and could not have asked for anything more. The house is perfect for 2 -6 and is completely furnished and comes with a well equipped kitchen. The washer. dryer was great for keeping rainforest damp clothes dry. We grilled every night and enjoyed quite evenings in our secluded retreat. Wayne and Sharon check in to make sure all is well and Sarah the property manager is there for any problem, like the one we had when a bear got into the trash bin. And when you are ready for a little information about the outside world, the DISH is nice to have. You can package your stay with the Red Dawg suv and a skiff. We highly recommend this centrally located house for fishermen and adventure seekers alike. This is our second time at Red Dawg and as hard as it is to believe they only continue to improve the experience from our already amazing stay a few years ago. The package with the house and vehicle and now a skiff rental made sure our group of 6 had very little down time - freshwater and saltwater fishing, sightseeing, exlporing etc. ...as usual our week went by way too quickly. The house was in impeccable shape, had all the amenities to make life comfortable (boot dryers, big coolers, rod holders, chest freezer...the list goes on) and on top of that the owners made sure to answer all our questions and checked in to make sure everything was good while we were at the house. 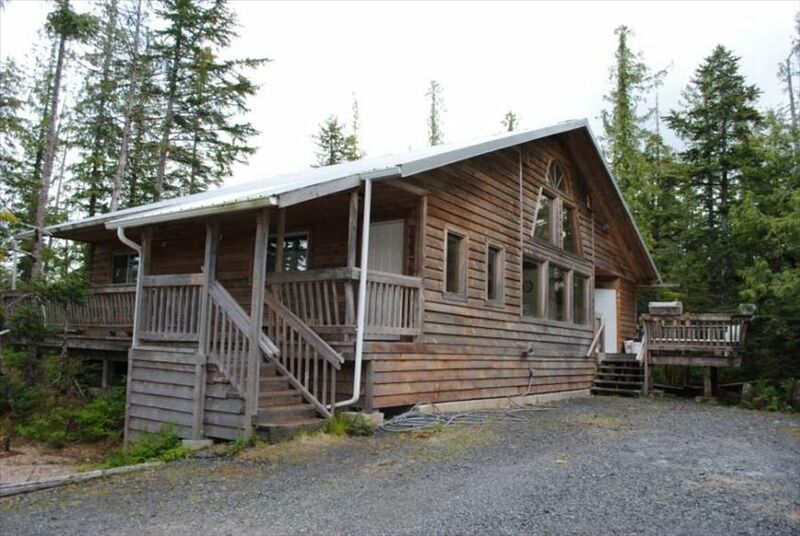 I can't imagine staying anywhere else and have no reservations about recommending this house for anyone visiting SE Alaska. We had a great time during our week's stay at the Red Dawg Retreat in Coffman Cove, Alaska! The accommodations were perfect for two Dad's and four teenage boys, for a week of Father/son fishing. We fished the saltwater (where the Coho can be caught right in the cove,) and explored several rivers. We caught salmon and halibut; saw lots of whales, eagles and bears. Wayne and Sharon have set up the cabin so that it has all the amenities for a very comfortable stay. It's perfect for a family or any group. The kitchen is well equipped with everything you need. The washer/dryer were very useful and the chest freezer will hold your entire catch. We utilized the suburban and skiff to explore and meet all of our fishing needs. Wayne was very helpful in providing useful information and fishing tips. Coffman Cove is a quiet little town with friendly people. It's a great place to experience the wild and beauty of Alaska. I would recommend the Red Dawg Retreat to anyone and plan to return!